Erarta Museum in Saint Petersburg will host an exhibition of Azerbaijani artist Vugar Muradov on October 7-22. The museum will display Muradov’s series of paintings based on the motives of the national carpets and carpet-weaving traditions of different schools - Baku, Ganja, Gazakh, Shirvan, Shamakhi, Karabakh, Guba, Ardebil and Tabriz. 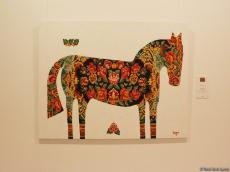 The exhibition entitled ” Similarities” was previously presented in Baku Museum of Modern Art, Trend Life reported. The talented artist born in 1967 is one of the iconic figures of modern painting of Azerbaijan.